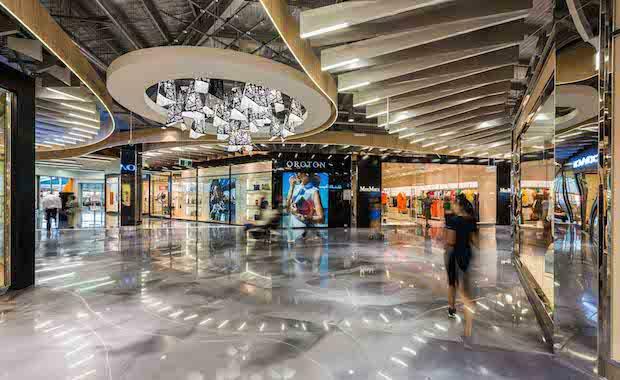 Direct Factory Outlet (DFO) in Sydney's Homebush will reach completion this month. Designed by Buchan Group, the centre’s face-lift reveals a new interconnected layout with a new large format retail level and food court precinct, spanning a total site area of 17,400sqm. The upgrade has been planned to fit the needs of the outlet’s tenancy mix and to create a customer-orientated shopping and leisure destination. The Buchan Group was appointed by CFS Retail Property Trust Group (CFX) in September 2012 to revise the centre’s original design, providing architecture and interior design, branding, environmental graphic design and signage services to the project. The new centre layout allows customers to be directed through retail and breakout zones while providing stimulating outdoor views of parks, sky and natural light, enhancing the overall customer shopping experience. The Buchan Group Principal Nathan Hones said the centre’s design concepts were explored through the use of materials and an architectural language that reinforced the centre’s modern factory outlet concept and identity. “Standout features include the mall’s central skylight and the vertical glass box at the northern end of the complex, which floods the food precincts with natural light, drawing parallels with the customer’s connection to the natural surroundings to establish a relaxed eating experience.," he said. Innovative CO2 sensors have also been installed in the outlet’s car park to monitor the building’s air quality output. Sydney DFO is located 15km from the CBD and has approximately 1,490 car spaces on site, two food courts, and includes five vertically integrated levels of shopping and parking.